The 2nd annual Pangos Best of West Shootout was held last weekend (March 30-31, 2019) at the beautiful 8 court Ladera Sports Center (Ladera Ranch CA). 100+ teams from California, Nevada and Arizona participated. A sizeable contingent of national/regional media/scouts and video outlets attended including Frank Burlison (BurlisonOnBasketball.com/McDonald’s All-American Game & NBPA Top 100 Camp selection committees), Ronnie Flores (BallisLife.com & Grassroothoops.net), Dinos Trigonis (Fullcourt Press, Pangos & Nothing But Net Magazine), Devin Ugland (Hoops by Ugland & PrepHoopsSoCal), Matt Rodriguez & Arek Kossyan (Ball is Life), Peter Walsh & Steven Barron (Bleacher Report), Arthur Puu (Overtime), Gregg Rosenberg (PrepHoopsAZ), Patrick Stanwood (Nothing But Net Magazine), Bryan LaRussa & Xavier Mejia (SLAM Magazine), Matthew Kovach, Jason O’Neill & Aubrey Gray (HoopsFactoryTV), David Chisholm (Dreamers), Richard Whiteside & Omar James (Hustle2k), Marcel Chappell (BallerVisions), Tanee Tanespolnsuk (Qwik11hoops) and Lew Roberts (Big City Hoops). The talent on-hand including 2020 #1 Evan Mobley made it “hands down” the most loaded event on the West Coast to tip-off the 2019 grassroots season. This Recap is Part I of a two part report on this event. 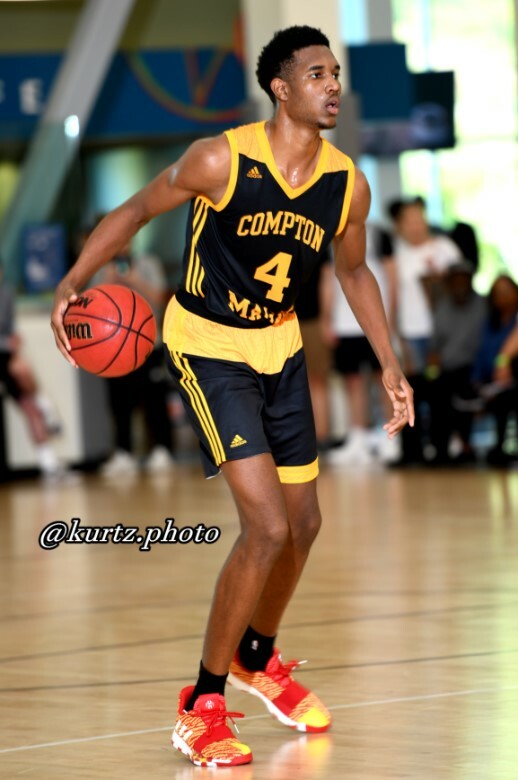 Evan Mobley 6’11” 2020 Rancho Christian (Temecula CA): Mobley’s rapid ascent to 2020’s #1 spot has mirrored his physical growth spurt over the past 3 years. Reminds me of a young Rasheed Wallace. Super-long and blessed with a bevy of dominant skills that make him a real X-Factor every time he laces them up, Evan is also a terrific student and person. Not too shabby odds that he joins older brother Isaiah as both a McDonald’s All-American and USC signee (and maybe a potential future Rhodes Scholar). Kyree Walker 6’6” 2020 Hillcrest (Phoenix AZ): Power wing is explosive to the rim like a cannon ball and is a very high-octane scorer. Love how hard he plays and competes. 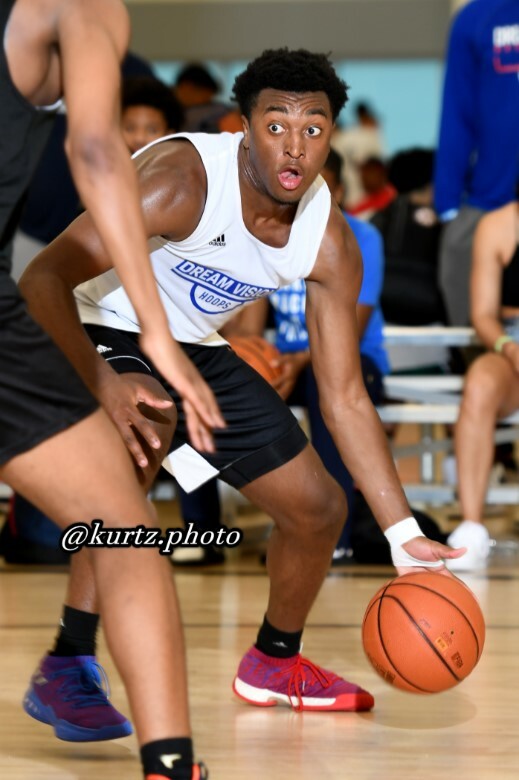 Top 20 national prospect in 2020 reminds me of stellar Arizona State freshman Luguentz Dortz (who just declared for 2019 NBA Draft). Makur Maker 6’11” 2020 Orange Lutheran (Orange CA): Cousin of Detroit Piston Thon Maker is a tremendous prospect in his own right. Ultra-long, skilled and bouncy, Maker is match-up nightmare for opponents. 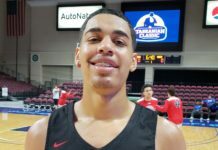 National scouts like Eric Bossi (Rivals/Yahoo Sports) are quickly noticing his off-the-charts upside (currently sits in the #15 spot of the most current 2020 Rivals 150. Juzang is a certified bucket-maker that is hard to stop when he gets hot. His excellent academic standing makes him a highly sought-after recruit coast to coast. Brother Christian Juzang started at Harvard this past season. Dinwiddie is a Kyle Lowry-type guard with big time scoring ability that includes legit 3-point range, a lethal mid-range pull-up and ability to explode over defenders at the cup. Poised to continue the Belmont Shore Lead Guard legacy this year. Keith had a 34 point outburst in a win over Westchester/Los Angeles and one of the best defensive coaches on the West Coast Ed Azzam this past season. 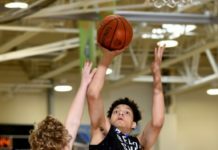 Fast-rising scoring guard has the athleticism to fly to the hoop as well as make plays on the defensive end. Ian was impressive versus Compton Magic Elite here, scoring 27 points. DeAnthony Melton (USC/Phoenix Suns) might be a good comparison at this point. 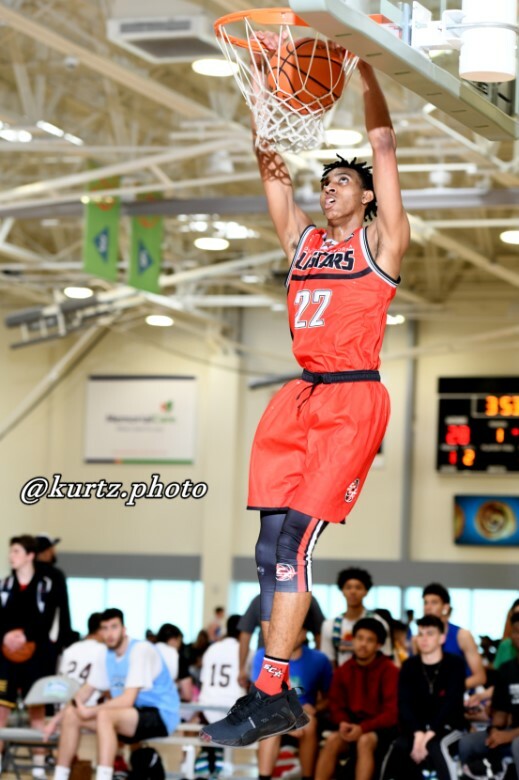 Jaylen Clark 6’6” 2020 Centennial (Corona CA): Explosive wing player with streaky perimeter shot is on the verge of taking his game to the next level this summer. Top-notch student too. Chibuzo Agbo 6’6” 2020 St. Augustine (San Diego CA): Strong and athletic WF showed off a very much improved outside stroke. Had a 40 point game for his St. Augustine squad this past season. Emmanuel Taban 6’7” 2019 Apollo (Glendale AZ): Still on the board for 2019, Taban is a sleek and athletic slashing scorer with nice long-term upside. Worth a long look for mids-to-highs looking for 2019 help. 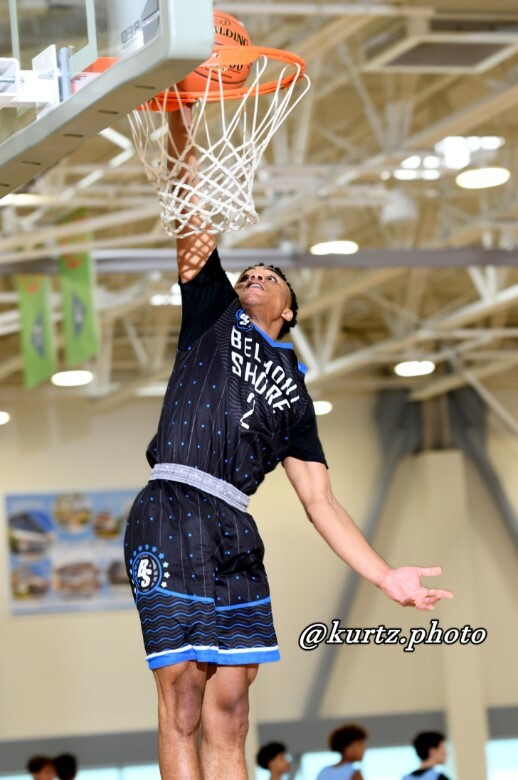 Strong, skilled & athletic 2022 forward with enormous potential! Already on the radar of high-major programs. Very underrated sharp-shooter helped his Cali Stars give Dream Vision a scare before fading in the final minutes. Smart player with grades to match, Prukop would be a great floor-spacer in the right system. Athletic lead guard is quick off the bounce and can finish at the rim. Committed to Gonzaga. Lefty flame-thrower plays with extreme confidence and is an underrated passer and rebounder. As his weight/strength improves, he will be even more of a problem. Top 100 prospect nationally in 2021. Savvy floor-general is swift in transition and has dangerous perimeter range on his shot. Excellent student has an increasing number of schools tracking him including Stanford and Utah. Very long and improved post player is oozing with high-major potential. Big time upside as a premier rebounder and rim-protector. Crafty young high-octane scoring guard can make big shots. Got a lot of Eddie House in his game. Already a social media sensation, Mikey is a strong and athletic WG that has very nice range on jump shot, pin-point passing ability and an impressive basketball IQ. As is becoming customary, he was the object of the video paparazzi here and his video on Ball is Life’s Instagram page drew 500k views within a few hours of its posting. Fast-rising 2019 unsigned senior is a terrific “3 & D” guard for the D1 level. Plays excellent defense too. Philadelphia PA native will be a good late-signee catch for the right program. Very promising young Big runs floor well and can finish in the paint. 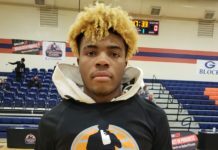 Already identified as one of the nation’s top 2022 prospects, high-majors will seriously continue to track. Strong and versatile swingman can score in a variety of ways and is an underrated passer. Excellent student has the athleticism to get the cup and finish as well as drain 3-point jump shots. 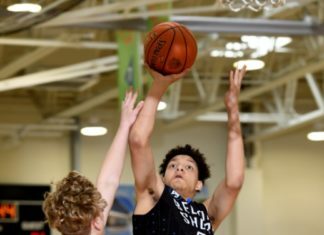 Stanford among the schools showing early interest for this BTI WG. Hunter Woods 6’6” 2018 Golden State Prep (Napa CA) Quality unsigned senior is a versatile swingman that has 3-point range on jump shot. Pasadena native is a NCAA D1 qualifier. Very solid combo-guard has impressive all-around game. Plays excellent defense, can finish at the rim and is a good perimeter shooter. Was set to officially visit Big West member Cal Poly prior to coaching change. Outstanding student too. Smooth WF with length has an impressive HM skill set. Wiry hybrid-forward is an athletic slashing scorer that plans on spending 2019-20 as a post-grad. Intriguing potential. Under the rader PF is a rugged rebounder that has ability to finish down low. As he gets in better shape, he will be an even bigger factor for the ICAN All-Stars. Very good student has very accurate perimeter shot. Late-blooming PF is very agile with a soft touch around hoop. Older brother Ezekiel Richards plays at Santa Clara. Strong wing with size has nice scoring ability. Young combo-guard with impressive skill package is one to monitor in 2022. Averaged 12.9 ppg this past season as a freshman. Much improved athletic combo-guard has nice touch on his 3-point shot. Currently holding an offer from NAIA member The Master’s University (CA).